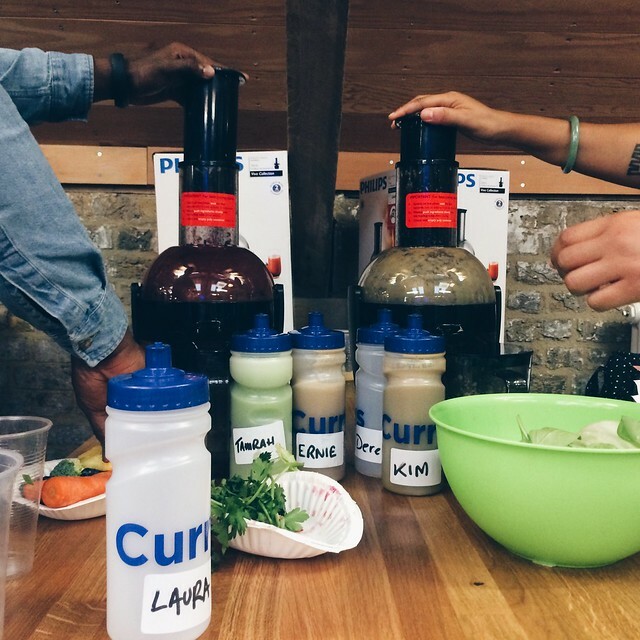 Last month Currys invited us to a bloggers' event to test out Philips' latest range of juicers. Over the last few years juicing has become a trend. Juicing is healthy, juicing makes you lose weight... So let's juice! First of all what is juicing? Some people might think it's simply drinking juice. Well technically yes. What I mean is drinking a glass of Tropicana Ruby breakfast isn't part of the juicing process. Juicing involves a process where the natural liquids, vitamins, and minerals are extracted from raw fruits and vegetables, this process strips away any solid matter from the fruits and vegetables and you're left with liquid only. Pretty straight forward right? - Juice detox is not great. Our body is not made to survive on juices only. Most of us know it but we'll still do it. It's wiser to add the juice as part of a daily routine. - Forget the 5 fruits and veg a day rule, IT'S ACTUALLY 8!! - Do not use too many fruits in your juice to exceed your daily fructose (sugar) allowance. - Do include more vegetables in your juice to keep the sugar level down. Stick to one or 2 piece of fruits. After the little juicing lesson we tested the juicers. 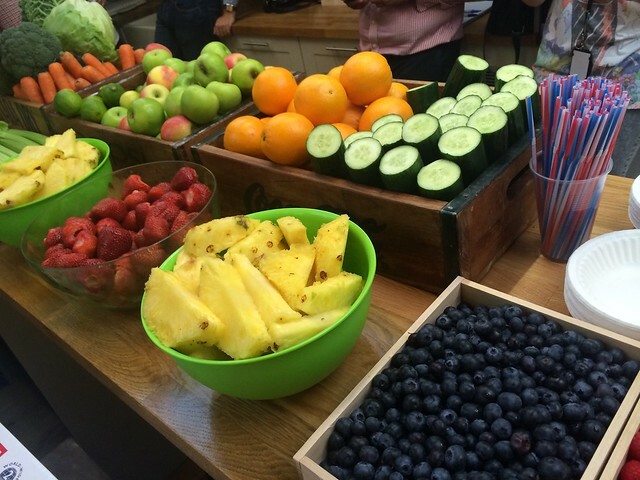 We had a range of fresh fruits and vegetables to use. Note to myself: Bloggers are fast to get fruits ahahah, I'll have to be quick next time in order to have more choice. 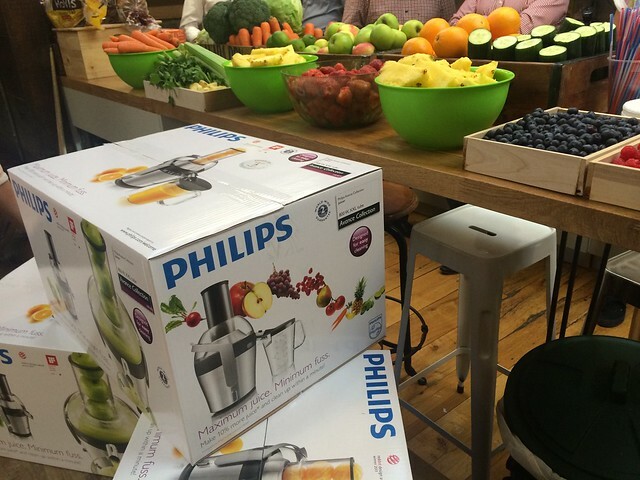 The juicer we got to test out was the Philips HR1871 Avance model from the Currys collection of juicers. Really easy to use. Just don't put any stones in it! 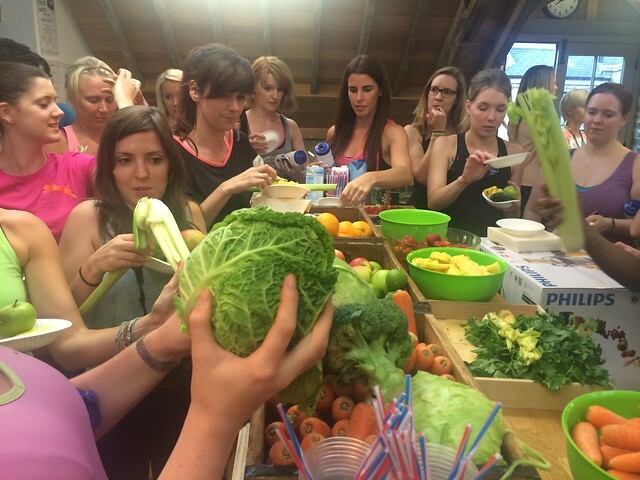 In case you wanted to organise a Juicing party with a few friends make sure you clean your juicer after 2 or 3 uses. I was the last one to use it (out of four) on the day of the event and my juice was not liquified at all. It was very pulpy to say the least. The taste was there but not the texture. When we tried out a clean juicer however the taste was perfect! No pulp- yay! We did try to wash it in one minute like it says on the box but it took us a 3min 48secs to be exact! Yes, we timed it. Have to test it fully right? Although it takes a bit longer than a minute to clean it is really easy to take apart and put back together again. 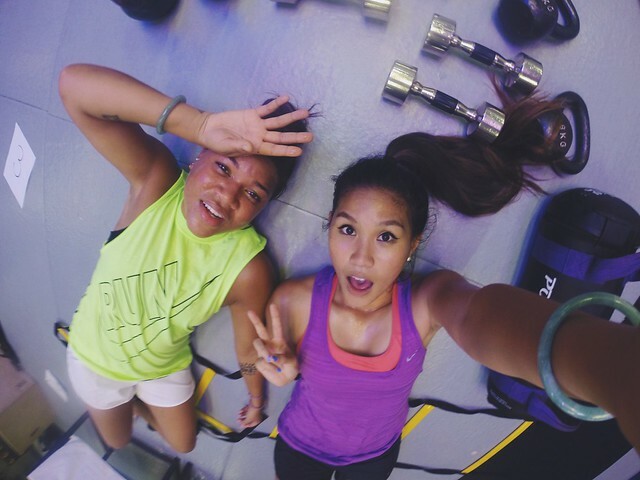 After the Juicing Lesson, Derry took us to the Urban Kings Gym for an intense HIIT body conditioning session. When it comes to juicing you can be has creative as you like, that's fun part of it. We really enjoyed it. You'll notice that once in a while your juice will look kind of brown, and not as green as it should. As you become more of a experienced and creative juicer, you'll learn that green vegetables and berries will turn your juices into a not so appealing colour! But, hey if it's good for you and it tastes good, what's the big deal?